ReflectedIdeas provides customization of ShopSite, which includes development of custom ShopSite modules, styling the ShopSite templates and extending the capabilities of the ShopSite platform. Below are some samples of the work that we have done for our customers. Shipping tangible goods requires the use of a package delivery company like UPS, Fedex or US Postal Service that will do the actual transportation and delivery of the goods. If the customer specifies an incorrect shipping address then the delivery will either fail or it will require the delivery company to search and correct the shipping address for an additional fee. Whether it is a failed delivery or correction of the delivery address, that will inevitably incur an extra cost paid by the merchant. Our module can use one of the several online or offline databases provided by the big package delivery companies or by third party vendors. Using an online database is preferable because these database are always kept up-to-date. 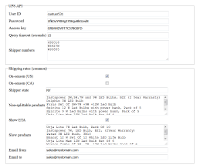 This address verification module can be used not only with ShopSite but also with other shopping carts that are either open-source or flexiable enough to allow external modules. To go back to the checkout screen and then edit the shipping address manually. To continue the order submission anyway. 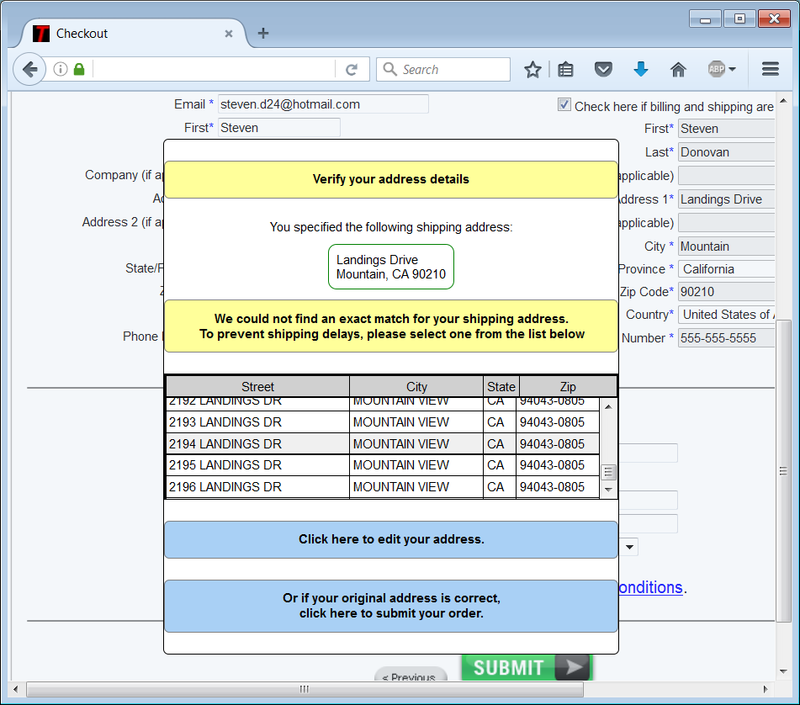 The user can choose this option if he/she is certain that the originally entered address is correct. 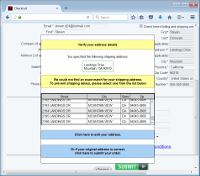 If you need additional information about the address validation module for ShopSite or if you would like to integrate address validation with your shopping cart, click here to send us an enquiry. In most cases it is possible to ship tangible goods through different shipping methods using different shipping companies. Even when there is only one shipping company that can do the delivery it is still possible to choose from different service types provided by the delivery companies. For example one can choose between ground and air shipping, between normal and expedited delivery and so on. The different shipping methods provide tradeoffs between various shipping characteristics like price, speed of delivery, reliability, etc. That is why most merchants provide multiple shipping options to their customers, allowing customers to choose the one that suits them best. One customer might need delivery for tomorrow morning. Another customer will prefer a slower delivery that will take 3 business days, but is at half the cost of the expedited delivery. A third customer will prefer the most reliable option where the chance of lost or damaged goods is minimal. We have developed a custom ShopSite module that provides the merchant with multiple shipping options and allows flexible setting of the different options that calculate the shipping prices. If you need additional information about our shipping rates module click here to send us an enquiry. This shipping method allows shipping via USPS. Our module supports various business rules that allow the merchant to choose the type of container used for each type of shipped item. 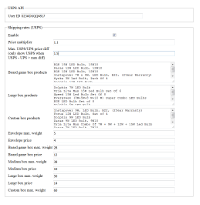 The selection of container is done based on the item name, weight and/or price. When multiple container types are allowed for a given item, then the lowest cost container type is chosen. Additionally the items are grouped in such a way as to use the containers space optimally, thus minimizing the shipping cost. Whenever custom boxes are used the USPS database is queried for the up-to-date shipping rate. Additional premium shipping at extra charge is supported for customers that want their shipment to be processed faster. The UPS online database is queried for the current shipping rates, so the displayed shipping prices are always up-to-date. The network communication code is optimized for heavy use and caches data aggressively, thus minimizing the response time. The UPS module supports fallback mechanism which activates in case of network failure. 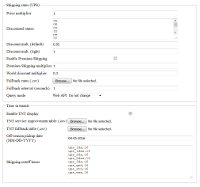 When fallback is active the UPS module will query a local database which gives less precise pricing but allows the system to continue working even in cases when there is no connection to the remote UPS server. The fallback UPS rates are configurable from a separate control panel available to the merchant. For orders weighing 500 or more it is usually cheaper to ship using freight. That is why our shipping module allows the freight shipping method. It has various configuration settings allowing the merchant to configure the shipping price based on the weight of the shipment. Some users prefer to pick up their order from the merchant's warehouse. This shipping method allows merchants to offer customers that option. 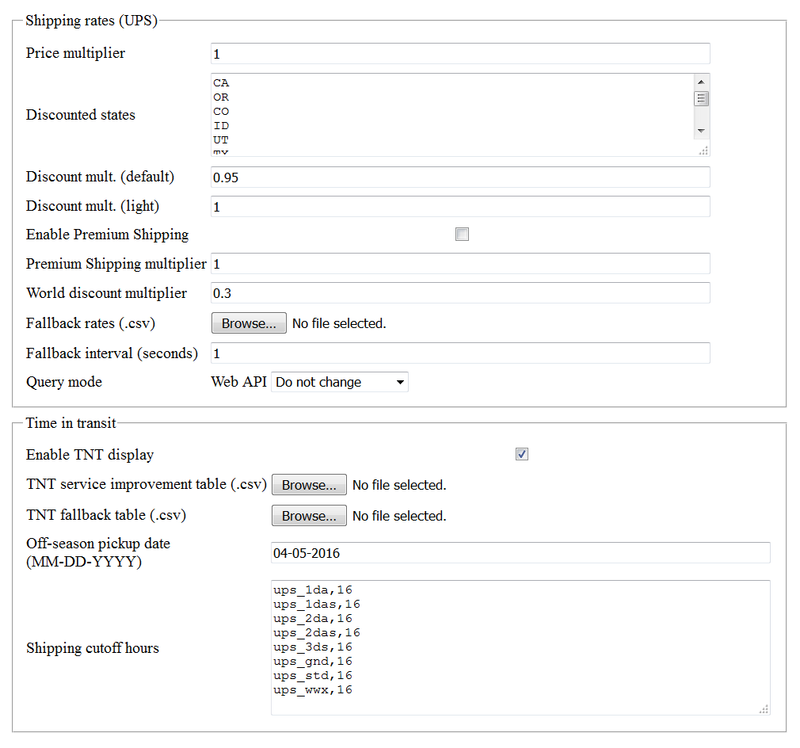 It allows a minimum cutoff price so that the option is shown only for orders above a certain minimum price. 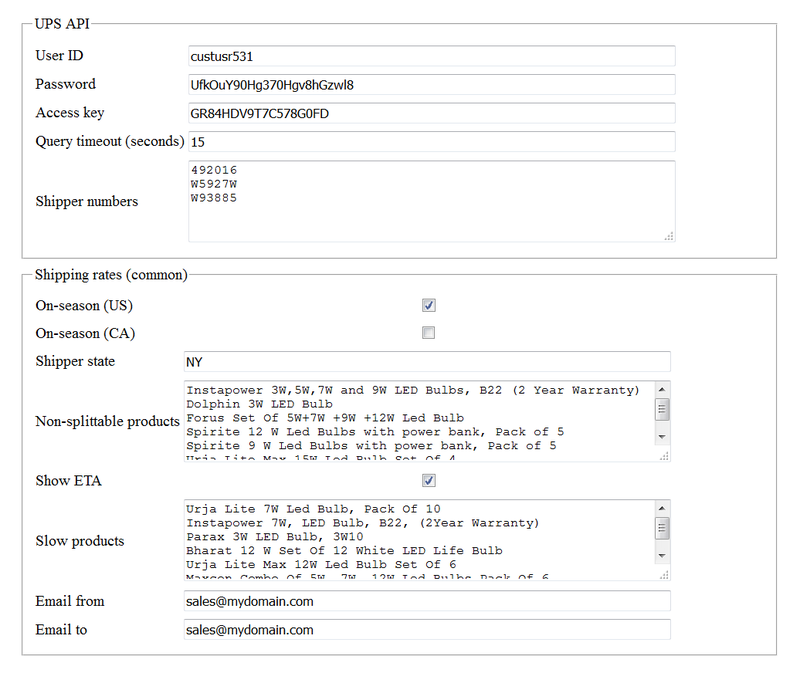 In most cases after an order has been entered in ShopSite it has to be processed further by the merchant. Usually this processing includes printing package labels and packing slips, printing the sales receipts, exporting them to the company's accounting application or to the warehouse database. For orders that are shipped via USPS or UPS, the corresponding shipping labels and packing slips are generated and printed. 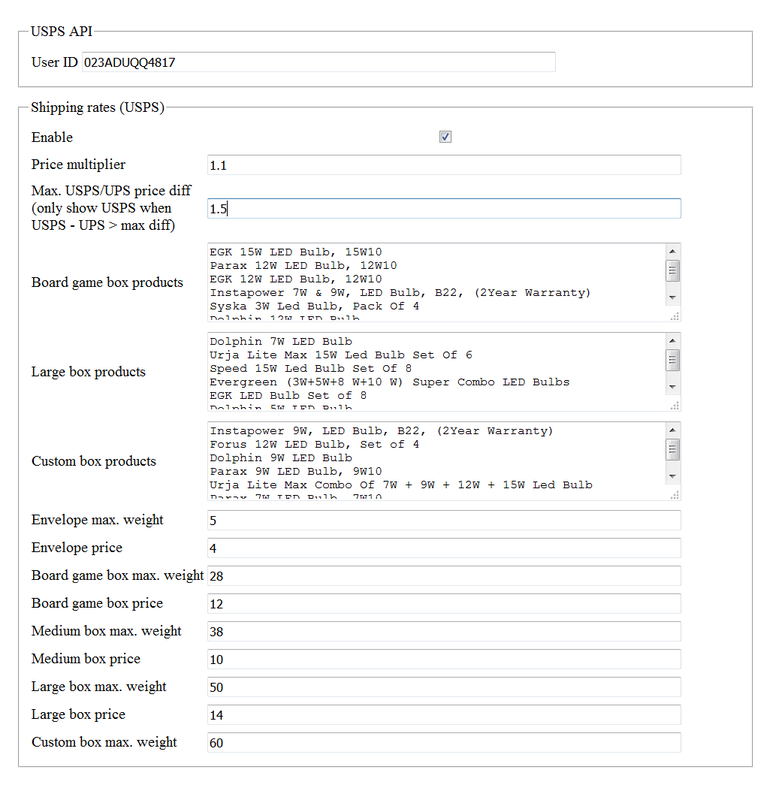 During the labe/packing list generation the shipped items are automatically fit into packages in an optimal way as to minimize the shipping cost. The actual printing is done through integration with Dazzle (a free label-printing application provided by USPS) and UPS WorldShip (a free label-printing application provided by UPS).